But how do those red-and-blue plastic glasses actually work? What about those vivid, full-color movies you've seen at Disneyworld or in an IMAX theater? And what does the future hold in store for 3D technology? The View-Master is a form of the stereoscope, the first technology to popularize 3D viewing. Image courtesy of fisher-price.com. The earliest forms of 3D glasses were not glasses at all. In the mid-19th century, Charles Wheatstone discovered that simply viewing a pair of similar (but not exact) images side-by-side can give the impression of three-dimensionality. The images are taken by two cameras that are slightly separated. This way, the photographs mimic what each one of our two eyes would see in reality. This method is far from ideal, however. It requires people to "cross" their eyes, which some people cannot do or find uncomfortable. In the late 19th and early 20th century, the stereoscope was invented to address these issues. The stereoscope used lenses that merged the two distinct images into one, giving the effect of a 3D scene without straining the eyes. The stereoscope was a popular novelty in bars and arcades until around the 1930s, when film became the dominant media for entertainment. Surprisingly, even today most people are probably familiar with the technology. 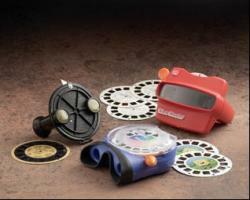 The View-Master, a ubiquitous childhood toy for over 65 years, is a version of the stereoscope. "It is truly a phenomenon that has transcended the toy box to achieve pop culture status," according to Chuck Scothon, senior vice president of marketing at Fisher-Price. SI's latest Swimsuit Edition features anaglyph images. They remain popular largely because of their low cost. Image courtesy of SI.com. When most people hear the term '3D,' they don't think of stereoscopes or View-Masters. Instead, flimsy plastic glasses with red and blue lenses usually come to mind. These glasses, when used with special photographs called anaglyph images, create the illusion of depth. Traditionally, anaglyph images were taken using two slightly separated cameras, one with a red filter and one with a blue filter. Recently, the filtering is being done afterwards with a processing program like Adobe Photoshop. In both cases, the images are then combined to form a single picture, or anaglyph image. When viewed without 3D glasses, these images will look blurry and discolored. Using a red and blue lens 'tricks' the brain into seeing a 3D image. Each eye sees a slightly different image. The eye covered by the red lens will perceive red as "white" and blue as "black," and vice versa for the other eye. This disparity mimics what each eye would see in reality, as with most 3D technology. Because the traditional red-blue glasses are inexpensive to produce, anaglyph images remain popular in modern media. Anaglyph images can be found everywhere from Disney's feature film Spy Kids 3D to the latest Sports Illustrated Swimsuit Edition. Polarizing lenses allow different images (green and blue arrows) to reach each eye. Image courtesy of howstuffworks.com. To understand polarization, think of a garden hose. If you shake the hose up and down, you will generate vertical 'waves' that also move up and down. We would say this wave is vertically polarized. Similarly, shaking the hose left to right will generate waves we call horizontally polarized. Light is a wave made up of electric and magnetic fields that vary in time and, like the garden hose, it can be made to be vertically or horizontally polarized. This polarized lens system is used at Disneyworld and Universal Studios and in IMAX 3D theaters across the country.